Sandwich cookies on the production line. Butterbing started as an honesty stall on a Fitzroy North front porch. 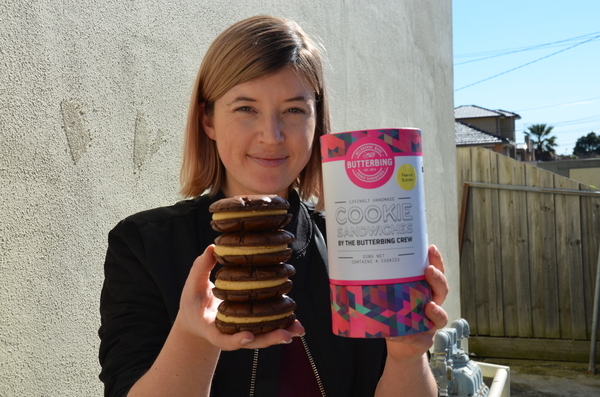 Simone Clark now sells her Dandenong South-baked sandwich cookies to cafes across the country. “It started in my home kitchen in 2013,” she said. She’d place baked goods in a fridge on her front porch and neighbours would grab them and leave cash behind. “I would also bake and deliver to nearby cafes either by foot or by bike,” Simone said. She moved into a commercial kitchen in Eumemmerring through a sublease she found on Gumtree, and recently into a Dandenong South factory space. “We’re pretty much dotted all over cafes around Australia now,” she said. 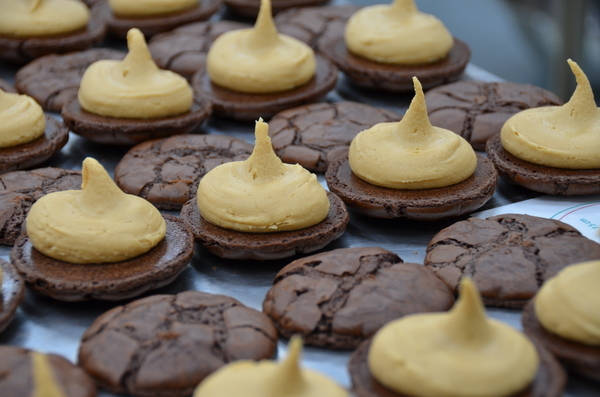 Butterbing exclusively makes brownie cookie sandwiches filled with butter cream and ganache. Simone was the first to market with the product so had to pioneer the packaging and more. “We have over 50 recipes of butter cream on rotation,” Simone said. “It’s always the same chocolate cookie. We just change the centre. “Initially when the bakery started I had a whole range of products and my focus was very different. “About six months into that I started making these cookie sandwiches. They just were an instant hit. She rebranded as a cookie company instead of a general baking company. “Typically cookies are quite dry. Ours are really quite the opposite of that. “They’re, basically, a cake in cookie form. They’re really moreish. “I don’t have a traditional sweet palate. They are pretty sweet but they’re not excessively sweet. Simone has found a niche in the speciality coffee scene and wants to expand her reach further interstate. “But we want to make sure that we stay a classic product,” she said. Every Butterbing cookie is handmade, from the batter through to the flavours in the buttercream. “It’s very much a labour of love,” Simone said. They’re born from discussions around the lunch table, food trends and partnerships with other companies. “It’s quite hard for people to move away from caramel and chocolate,” she said. “It’s typically the combination that people absolutely love. Simone’s team also makes birthday cake-sized Butterbings and recently introduced a gender reveal sandwich cookie.